The literal meaning of 'swing plane' should be the plane of swing motion on which the main part of the body and club move. However, since golfer's body is a 3-dinmensional structure, it is impossible to move the body on single plane. 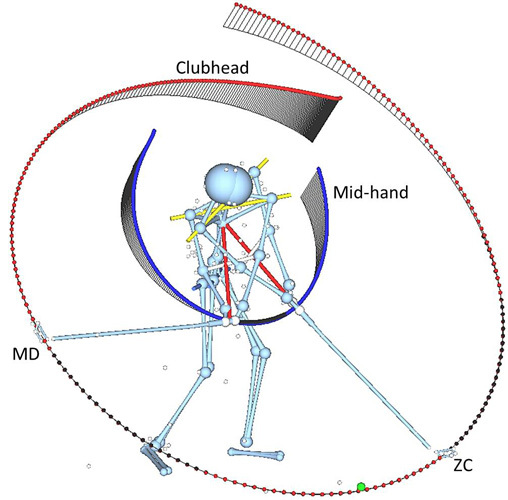 During a swing, none of the body parts nor club consistently moves on single plane. Does this then mean the notion of swing plane is meaningless. Not really! The central aspect of a swing is club's motion (clubhead's motion, to be exact). Considering the fact that only one end of the club is constraint by the hands and that the club makes a fast angular motion during the downswing, the club must have a strong tendency of planar motion. Therefore, it may be possible to identify the swing plane for at least a part of the downswing phase, if not for the entire phase. The swing plane must be objective and quantifiable. Since the ball is struck by the clubhead, the clubhead is the main part of the moving golfer-club system, not the shoulder or arm line. Considering the anatomical structure of the body and joint ranges of motion, it is unrealistic to expect the clubhead to show a planar motion during the entire downswing phase. The phase needs to be narrowed down. Figure 1 shows three different downswing phases from which the best-fit planes are computed mathematically: TB-MF, ED-MF, and MD-MF. When the TB-MF phase is used, the actual clubhead trajectory deviates from the best-fit plane substantially at the beginning of the downswing in particular. When the ED-MF phase is used, the fit improves but still a relatively large deviation is observed near ED. The MD-MF phase provides a fairly well matching best-fit plane, which means the clubhead motion in this phase is nearly planar. The best-fit plane computed from the clubhead trajectory in the MD-MF phase is the functional swing plane (FSP). Figure 1. Best-fit planes computed mathematically based on the clubhead trajetory in three different downswing phases (driver): TB-MF (A), ED-MF (B), and MD-MF (C). The red dots show the actual clubhead trajectory while the black dots show the clubhead trajectory projected to the best-fit plane. 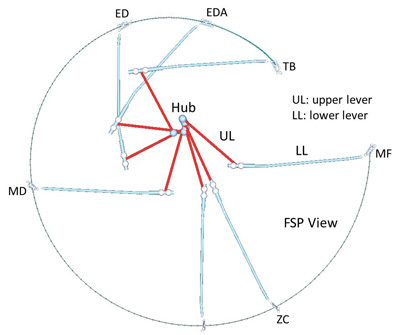 Figure 2 shows the trajectories of the clubhead (red) and the mid-hand point (blue) and their projected trajectories on the FSP. Two swing events are shown in this figure: MD and ZC. It is clear that the mid-hand point stays on the FSP during the main phase of the downswing (MD-ZC). Therefore, the FSP can aslo be viewed as the motion plane of the whole club at least during this phase. Elite golfers show well-defined FSPs. Figure 2. 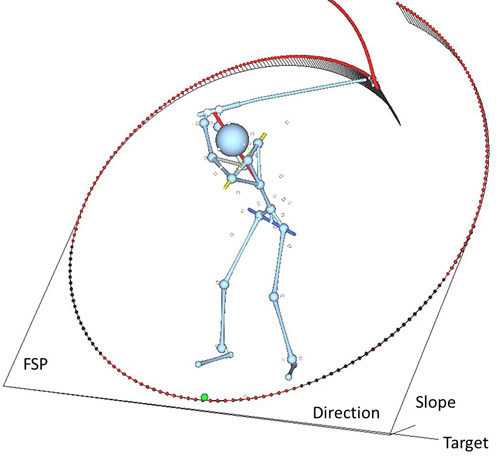 Clubhead (red dots) and mid-hand point (blue) trajectories and their projected trajectories to the FSP. The mid-hand point generally stays on the FSP between MD and ZC. Figure 2 also shows the on-plane and off-plane motions of the clubhead. The thin black line on the FSP (projected trajory) shows the on-plane motion of the clubhead while the deviations from the FSP show the off-plane motion of the clubhead. The clubhead moves down toward the FSP quickly as soon as the downswing commences and stays fairly close to the FSP as early as ED. Since the FSP is the main plane of motion in the downswing, angular motions of the body lines and segments can be assessed on the FSP. The first set of parameters that can be obtained from the FSP is its slope and direction. Slope of the FSP is the angle it forms with the ground. The shorter the club is, the steeper the FSP is. The direction angle is computed relative to the target line on the horizontal plane: inward or outward. For a right-handed golfer, an outward FSP means the plane is pointing the right side of the target, vice versa. The slope and direction angles alone can provide valuable information about the golfer's swing motion. Figure 3. Slope and direction angle of the FSP. The dIrection angle is measured relative to the target lineL inward or outward. Figure 4 visualizes the instantaneous centers of rotations (COR) of the clubhead computed based on the projected clubhead trajectory. The red dots are the instantaneous CORs which are essentially the centers of curvature (COC) of the projected clubhead trajectory on the FSP. The rotation arms (lines drawn from the COC to clubhead) show the on-plane motion of the clubhead while the deviations from the FSP show the off-plane motion. Motion of the COC reflects smoothness (or abruptness) of the clubhead motion. The point where the COC trace shows sharp changes in direction are the instants the curvature changes abruptly. Figure 4. Instantaneous rotation centers (centers of curvature; red dots) of the clubhead and rotation arms (gthin green lines). The FSP can be used in various ways in assessing the swing characteristics of the golfer. For example, the rotation of the body and club can be simplified to the motions of two levers rotating on the FSP (Figure 5). Not only the upper and lower lever angles, but also angles of various body lines (such as the pelvis and shoud line angles and the X-factor) can be computed on the FSP and used in scrutinizing the swing motion of the golfer. More over, swing styles can be classified based on how the clubhead moves with respect to the FSP. Figure 5. The on-plane angular motion of the upper and lower levers in the functional double-pendulum perspective. The moving hub is located at the mid-trunk point, the mid-point of the tip of sternum and the spinous process of T12. The upper lever is the line connecting the hub and the mid-hand point. The length of the upper lever changes as the shoulder girdles and arms move. The lower lever is the club. Kwon, Y.-H., Como, C., Singhal, K., Lee, S., & Han, K. (2012). Assessment of planarity of the golf swing based on the functional swing plane of the clubhead and motion planes of the body points in golf. Sports Biomechanics, 11(2), 127-148. DOI: 10.1080/14763141.2012.660799.